I’m a proud first-year student in the Masters in Latin American and Caribbean Studies program, and I’ve been a part of ROC (Runasimi Outreach Committee) since I began the program. Every month, we host an event called a Quechua Night. Sometimes they are 20-people events in an NYU venue, and sometimes, as in the Queens Museum on the 30th of March, they are gigantic events. 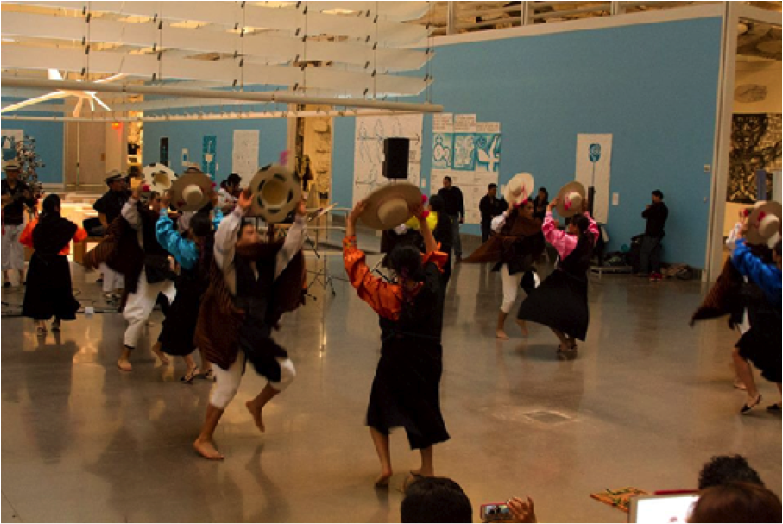 It was a grey and rainy Sunday, yet around two hundred people of all ages and origins showed up, ready to celebrate Quechua, Kichwa, indigeneity, and learning new things in a myriad of ways. After Michael Abbott, our current president, began to address the crowd warmly and confidently in Quechua, much of the event became a blur to me, since I became intensely focused on teaching people how to embroider pre-Columbian iconographies onto wired ribbon bracelets. You see, textiles and handicrafts are one of my passions, and in ROC I’m able to share and impart this part of my life with others. There were many workshops that attendants could participate in: recording a podcast in Quechua with Christie Mladic-Janney, painting with Elva Navarro from New York Quechua Initiative, learning some Andean dance-moves, and more. Even after the workshops were officially over, people kept coming, eager to learn how to make a bracelet. 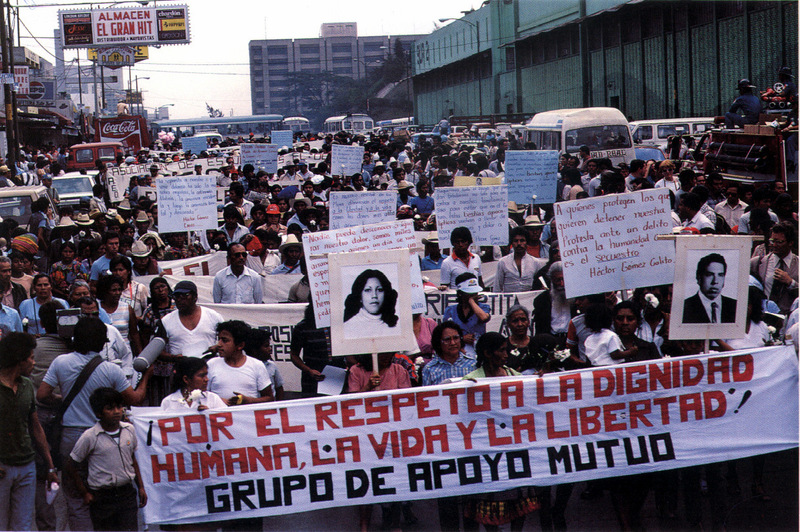 A woman named Rosa simply wanted to embroider her name on a bracelet. At the end, she asked me if she could take some materials home to teach her sisters-in-law how to do it too. “Llévate no má,” I said, happy that the workshop was going to spread even beyond the borders of the event! And that’s really what it all felt like, the breaking of barriers and borders, and a raucous dance party to end it all. 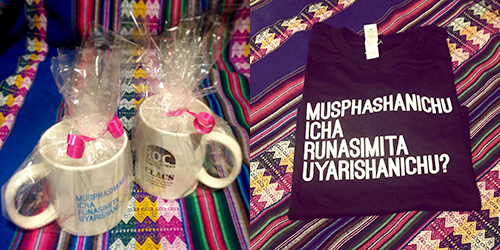 Quechua Mugs and Tshirts for sale! A few days ago, we hosted our first BINGO night! We welcomed guests with any relationship to the Quechua languages at our event, which we held in Jackson Heights, Queens. We partnered with Pachamama Peruvian Arts, a non-profit that offers free traditional Peruvian dance and music instruction for youth in Queens. While they held their classes, we hosted BINGO! To help those unfamiliar with the language, we passed out sheets that listed the numbers in Quechua. 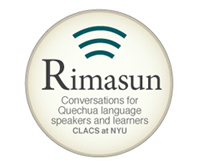 Our bingo caller was Gladys Camacho Rios, a Bolivian author and linguist who is visiting NYU for the semester. Although she called the entire game in Quechua, some of us held up the numbers as a visual aid. Players were awarded prizes from scholarly books on the Andes to woven coin purses—we even had a couple of bottles of pisco, thanks to the Peruvian Trade Commission! Thanks to everyone who came and made this special Quechua Night a success. 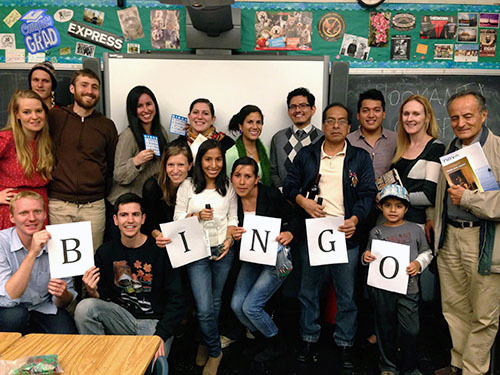 Given how much fun the night was, we definitely plan on throwing another Quechua BINGO night in the near future. Tupananchiskama! 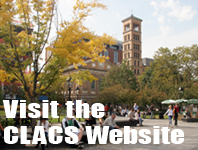 The focus of my thesis is on Quechua language, culture and media. During winter break last January, I went to Lima and met with Chirapaq headquarters, an NGO in Peru that supports indigenous culture. One of their oldest projects is “Sapinchikmanta,” which means “From our roots” in Quechua. This project trains people in Ayacucho and other parts of Andes to produce radio shows in the Quechua language along with Spanish.This summer, I decided to start my field work researching this project as part of my thesis project, but before returning to Peru, I was able to start my research in New York in May, when I attended the United Nations Permanent Forum on Indigenous Issues. I followed and attended presentations on community radio from Guatemala, and met people who identify themselves as indigenous from different parts of Latin America. In mid-June I arrived in Huamanga, the capital of Ayacucho where I began my work by meeting the staff of Chirapaq at their office in this city. They introduced me to three stations in the region. I was surprised to learn that that these stations only broadcast one hour a week. I read that that there used to be five stations, which broadcast more frequently. During the next two weeks, I visited each station. First in Huamanga, then onto Huanta and Wilcashuaman, about two hours away in rural areas with a distinct climate and history. I did interviews (in Quechua) with the producers and listeners.